Beeswax candles in colors combines the natural beauty of beeswax with a range of striking colors which can look lovely in many surroundings. Beeswax is a traditional form of wax and candles have been made from beeswax for centuries in cultures around the world. Beeswax is pure burning and has a natural fragrance that has the suggestion of honey. In its natural state, beeswax is available in a range of different shades of honey brown, from the lightest cream through to an earthy gold color. When beeswax is processed, however, some of this color is lost and some processes even bleach the beeswax to remove any form of natural color. The process of bleaching or lightening of beeswax can be done either by using chemicals or by exposing the beeswax to light. When the beeswax has been lightened it can be then be recolored. Beeswax candles in colors can make a great alternative to white or cream beeswax candles. Beeswax candles in colors can be colored using natural colorants or by using special candle dyes. Some people opt for the natural candle colorants, such as spices, as this complements that natural nature of beeswax. Other people prefer the wide color range that can be created from candle dyes. The choice is a very personal one and is often down to individual taste. Colored beeswax candles can be purchased from many places including general stores as well as specialist candle stores. They can also be purchased online. There are advantages and disadvantage of both types of shopping. Buying candles online can often be a great way to find good deals and large discounts, however it also means that the shopper is buying the candle without seeing it first. This can be a disadvantage when buying beeswax candles in colors as the color on the computer screen may not be accurate. The cost of delivery should also be considered when buying online. These disadvantages need to be weighed up against the time that it takes to go shopping in a store and the cost of fuel, plus any parking costs. Colored beeswax candles can also be purchased from artisan candle makers. Artisan candle makers often sell candles from their workshops or through craft shows and markets. 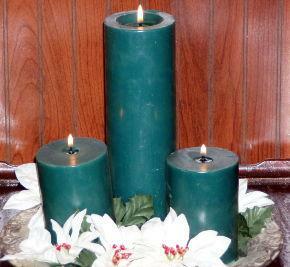 An alternative to buying colored beeswax candles is to make them at home. Rolled beeswax candles are easy to make at home and require little in the way of special equipment. These can be a good introduction to candle making. Sheets of colored beeswax are available from candle supply stores and these are simple to roll into candles around a candle wick. Special effects can be achieved by cutting patterns into the candle wax sheets or adding different colors of candle wax sheet pieces to the finished candles. One of the benefits of using beeswax sheets is that they do not need to be heated until they melt. They simply need to be warm enough to be able to be rolled without cracking. A hair-dryer will quickly bring the beeswax sheets to the right temperature if necessary. Whether you are buying colored beeswax candles or thinking about making your own beeswax candles, these are a lovely compromise between natural candles and brightly colored candles made with gel or other materials. They can be found in a wide range of colors and will enhance any home.